On Sunday, the President of Abkhazia Alexander Ankvab resigned under pressure from the opposition. A potential crisis was resolved after Moscow sent presidential aide Vladislav Surkov to mediate between the two factions. Abkhazia’s fourth president will be elected on August 24. Crisis struck early last week in this self-proclaimed Black Sea republic, which is recognized by just four countries. 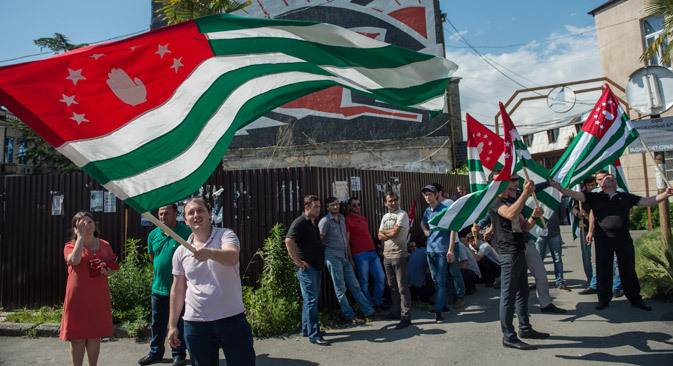 On May 27, Abkhazian President Alexander Ankvab, who had worked as president of the republic for less than three years of his five-year term as designated by the Constitution, fled the capital Sukhumi after a group of around 30 opposition supporters stormed the presidential administration following a rally in the city. A group of activists calling themselves "Ahatsa" were behind the opposition protests. The movement is in favor of reforms and integration with Russia. In particular, Ahatsa insists on the creation of a commission to monitor funds allocated to the republic by Russia. One would have to be totally uninformed about Ankvab to think that the opposition could expect him to lie down and submit. In the war of independence with Georgia, the tough leader, nicknamed “Iron”, won repute as a survivor of six peacetime assassination attempts. In short, he is not the type to go easily. At first, Ankvab reacted in his signature style – he broke off talks with opponents and left capital Sukhumi when opposition supporters began to storm the presidential administration. A few hours later, he made a televised address to the nation in which he described the situation as a coup attempt and advised the opposition to return to legal means. Then Moscow intervened. Since it had recognized the sovereignty of Abkhazia and declared itself the guarantor of peace and security in the republic, as well as the fact that it provides three-quarters of Abkhazia’s budget, Russia simply could not remain indifferent to this turn of events. Moscow was prompted by the crisis in Ukraine, which has heightened Russia’s vigilance to goings-on near its borders. Presidential aide Vladislav Surkov was swiftly dispatched to Abkhazia to resolve the crisis. Meanwhile, the Coordinating Council of Abkhazia, created a year ago as a union including 11 leaders of various parties and movements, had announced a national assembly, a democratic tradition that stems from ancient times, when it was decided that the most important issues in Abkhazia would be resolved with the participation of as many people as possible. The national assembly began on May 29 and was to last all week. On his arrival in Sukhumi, Surkov found the situation at a stalemate: The parties refused to negotiate, tension was rising, and a large number of President Ankvab's supporters were “camped out” dangerously close to the ongoing national assembly, which only hindered attempts to dissolve the opposition. Surkov’s arrival was welcomed. Surkov had to run between Sukhumi, where the opposition was located, and the Gudauta district, to where the president had retreated. Surkov’s shuttle diplomacy contributed to the peaceful resolution of the conflict. At the national assembly, “Iron” Ankvab officially announced his resignation on Sunday. Abkhazian political scientist Inal Khashig told the author that Surkov had chosen a pragmatic line. Surkhov’s main task was to understand which external forces can control or stand behind events in Abkhazia, and whether or not they actually do. “There are no such forces,” continued Khashig. “All the Abkhazian political elites are oriented towards Moscow. In this situation, when the fate of Abkhazia essentially depends on Russia, starting with security and ending with financial support, which the country cannot do without, it couldn’t be any other way. Abkhazia has no pro-Western, pro-American, or even any ‘pro’ forces, except for the pro-Russian forces. " After making sure that the republic and its entire political elite are more than loyal to Moscow, Surkov realized that it made no sense to support Ankvab, who was losing influence. After all, whoever replaces him will not change Abkhazia’s pro-Russian stance. In the meantime, Parliament has appointed Valery Bganba, the speaker of the republic’s supreme legislative body, as acting president. The story of Abkhazia’s third president once again shows that the division between public acceptance and rejection is very low. A bold, principled politician and a good head of the security agencies proved to be a weak manager. His opponents blame him for the fact that in the slightly more than two years of his reign, the republic has fallen into absolute financial dependence on Russia, and Russian economic assistance has been squandered. According to Khashig, another mistake that Ankvab made was his failure to address the issue of forming a national idea during his presidency. “The first president of Abkhazia, Vladislav Ardzinba, won the war of independence with Georgia,” said Khashig. “During the second presidency, that of Sergei Bagapsh, the republic's sovereignty was recognized by Russia and several countries. The crisis began long ago, but now there is a fork in the road. This is characteristic of Abkhazia. For years nothing will change, but it only takes a few days to overturn everything,” Khashig said. In late August, Abkhazia will elect its fourth president. So far, no candidates have declared their intention to run for the republic’s top job. But judging by the activity in the days of Ankvab’s removal, we can assume that the main contenders for victory are former Vice President Raul Khajimba and former Prime Minister Sergei Shamba. The winner will have one task – to reform government institutions and redistribute powers between the branches of government in order to ensure effective governance and prompt economic reform. Abkhazia is tired of complete financial dependence on Russia.